See the schedule of public forums and sovereignty TV shows. Public forums stream live on ‘Ōlelo 53. To enrich and extend the sovereignty conversation, we have developed some "home experiences" and puzzles. We offer an online forum for ongoing, public dialogue between (and during) the public meetings. Our December program may be the last in the series. It is a good, short summary, hitting the highlight topics of the year. Two broad topics for the program are important points in the history of Hawaii from the arrival of the missionaries to the statehood vote, and actions by the United Nations over the years that open the way for decolonization. There is also some discussion of activities on the neighbor islands where groups are living sovereignty. Our November program is an interview with Francis A. Boyle, the lawyer that OHA brought from the Midwest for the last meeting of Ka Mau A Ea. 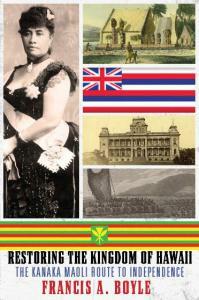 Professor Boyle has written a new book titled, Restoring the Kingdom of Hawai’I, The Kanaka Maoli Route to Independence. 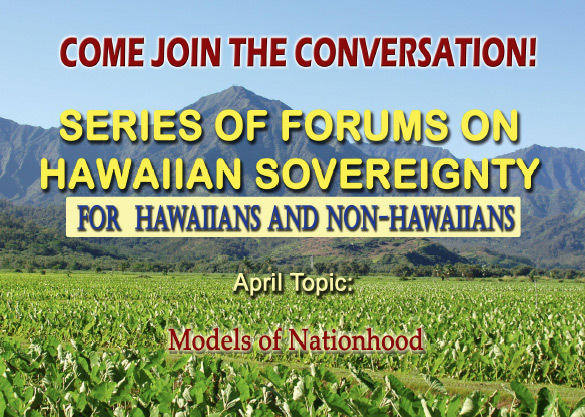 Hosts Poka Laenui and Kioni Dudley, and guest Dr. Kuhio Vogeler expand on the author’s concepts to include non-Hawaiian nationals and possibilities for a nation other than a kingdom. It’s a lively discussion. Our October program of “The Sovereignty Conversation: Community Forums” is a discussion of the economic possibilities for the new nation. It is an inspirational program about possibilities for a whole new approach to money and profits and the health, happiness, and well-being of the people living in the new nation. Dr. Kioni Dudley, Poka Laenui, and Leon Siu welcome special guest Professor Larson Ng of the College of Education, who is teaching the new view of economics to his students. Please tune in to this fascinating program about our future. In this important September program, co-host Kioni Dudley discusses things that will greatly affect Hawai’I in the future: rising seas, groundwater inundation, the high cost of oil from carbon caps, accompanying high costs for everything, limited imports, changing wind patterns, decreased rainfall, strained aquifers, declines in tourism, out-migration because of the high cost of living. Unless action is taken soon, the future Hawaiian nation might be stuck with empty high-rises sticking up in muddy swamps, and no financial ability to clear the land. Co-host Poka Laenui, and other guests, Puanani Burgess and Ho’oipo DeCambra, offer other fascinating ideas of what the future nation might be like and things it might accomplish. In this important August program, Pōkā Laenui and Leon Siu speak of other nations that have achieved decolonization and how they accomplished it. Most of the member states in the United Nations were at one time colonies. Poka Laenui and Leon Siu discussing their work at the United Nations over the decades and at present. They talk about colonization and how the majority of the member nations of the UN were still colonies just 50 years ago, how they were decolonized, and how we can move to independence with UN help. This is followed by Henry Noa, who tells us about how he organized his group, the Reinstated Hawaiian Government, modelling the government on the Kingdom government, even using the old districts, and electing legislators from each. This is a fascinating look at a process that has been developing for some years — Hawaiian nationals moving ahead, recreating structures, living as citizens of the Kingdom. The last few minutes of the program feature Poka, who notes that there are other models of nationhood than the Kingdom, and who talks about the Native Hawaiian Convention recessed in 1999, and how we should move to continue it, since it includes all of the Hawaiian nationals that are excluded in the Kana’iolowalu convention. 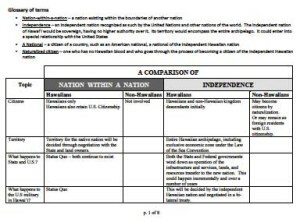 The Sovereignty Conversation community forum in June 2014 made reference to a table comparing and contrasting the nation-within-a-nation model of nationhood with the independence model. This document is now available here as a PDF and will also be referenced in the July forum. Click image for full-size PDF file. Guests are Governor John Waiheʻe and Robin Danner of the Kanʻiolowalu Commission, Leon Siu, and Poka Laenui. Saturday, June 28, 11:30 a.m. – 1:00 p.m.
Monday, June 30, 8:30 p.m. – 10:00 p.m. The Olelo schedule lists another recorded broadcast of the June program on Saturday, July 12, 11:30 am on ‘Ōlelo Channel 53. 8:30-10:00 p.m. on Olelo Channel 53. Also shows Saturday, May 17, 11:30 am. 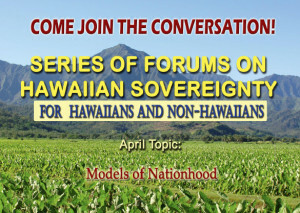 The fourth program in the television series, “The Sovereignty Conversation-Community Forums,” will be shown on Saturday, April 26, from 7:00 p.m. to 8:30 p.m. on ‘Ōlelo Channel 53 (also streaming online). This segment begins three programs on the Models of Nationhood. Soulee Stroud, President of the Association of Hawaiian Civic Clubs (worldwide), and Mehealani Wendt, member of the Kana’iolowalu Registration commission, speak for the “nation-within-a-nation” model, and Leon Siu, Minister of Foreign Affairs for the Hawaiian Kingdom, speaks for the “independence” model. Attorney Poka Laenui moderates this fascinating discussion. Should you miss, or not tape, the program on Saturday evening, it will be re-broadcast on 5/2 at 3:00 PM, 5/3 at 8:00 AM, and 5/8 at 9:00 AM, all on Channel 53. Beginning in May, we will return to live broadcasts before a community audience and we will be switching to the third Friday of the month.